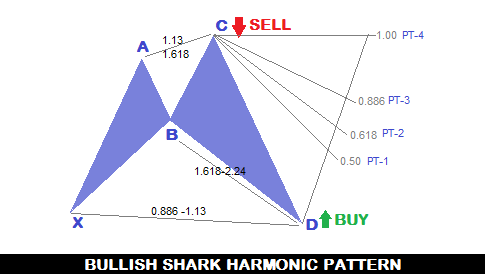 Bullish Shark Harmonic Chart Pattern confirms a buy signal upon completion of the pattern. 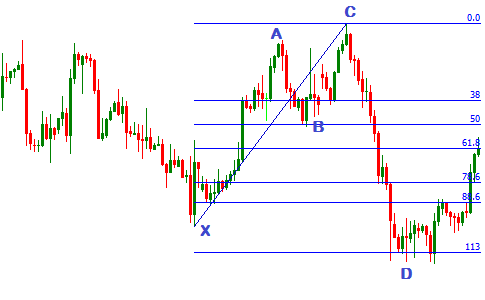 It is an XABCD pattern that has higher reliability than other bullish harmonic chart patterns. This post is written to explain the way to draw a bullish shark harmonic chart pattern, and to explain the technique to trade bullish shark harmonic pattern in forex trading. 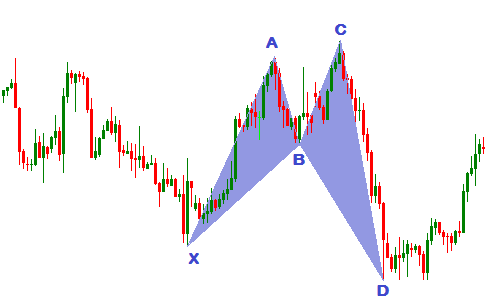 How to draw a bullish shark harmonic chart pattern ? To draw a bullish shark harmonic chart pattern first we have to find the point X and point A of bullish shark harmonic chart pattern. The tusk is very simple to do, just find the point X at the bottom and point A at the top of a strong bullish trend. Now we should start a Fibonacci retracement tool from point X and end at point A to find the point B.Though this step is not obligatory to draw a bullish shark harmonic chart pattern, but I just prefer to confirm that the retracement is not higher than the 61.8% of point X. 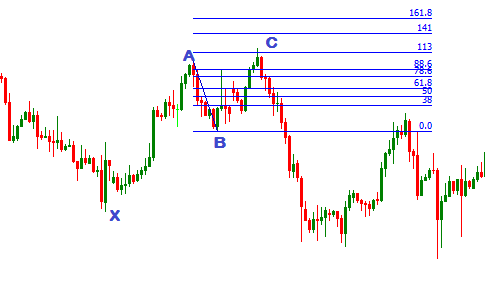 In third step, we should start a Fibonacci retracement tool from point A and end at point B to find the point C. Point C should be confirmed at the 113% to 161.8% retracement area of A. In other words the ratio of BC and AB should be 1.13 to 1.618. In this step,we should start a Fibonacci retracement tool from point B and end at point C to find the point D. Point D should be confirmed at the 161.8% to 224% retracement area of B. In other words the ratio of CD and BC should be 2.24 to 2.618. 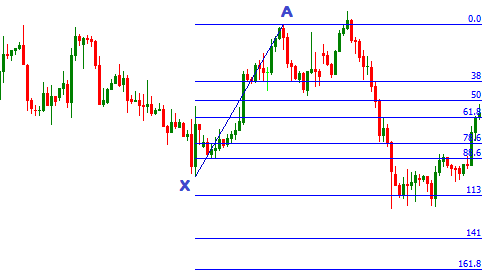 Here we should start a Fibonacci retracement tool from point X and end at point C to reconfirm the point D. Point D should be confirmed at the 88.6% to 113% retracement area of X. In other words the ratio of CD and XC should be 0.886 to 1.13. The XA, AB, BC, CD, XB and BD straight lines should be drawn to find the bullish shark harmonic chart pattern. How to trade the bullish shark harmonic pattern in forex trading ? Generally, a buy signal is found when the point D of a bullish shark harmonic pattern is confirmed. The stop loss for the order can be placed at the next fibonic retracement level e.g. 141% of Point X. 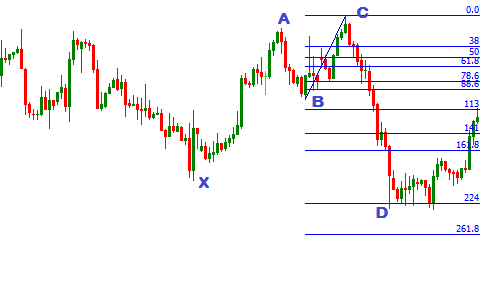 The take profit for this order can be placed at the 38.2%, 50%, 61.8% ,88.6% or 100% retracement of point C , depending on the fundamental condition. A sell signal can also be placed at the point C, but only if the point C reaches at the 161.8% retracement of point A. The stop loss for this order can be kept tight, and the take profit for this order can be placed at the point D.
Dear Traders, If you have any question regarding this post, you can drop it into the comment section below. I generally response to your comments within 24 hours. A sell signal can also be placed at the point C, but only if the point B reaches at the 161.8% retracement of point A.
I'm really confused with this. Do you mean .618 retracement of B? coz if it's 1.618, it already exceeds point X.
Dear friend, it was my mistake, now it is edited, have a look. Thank you so much. Great learning material and the question above was an easier fix for you! Will keep reading your post so I can learn more! Great details and material!